If you live in an area where people frequently park illegally on your property, you may be unsure of how to solve this problem. You can call a towing company to come and remove the car, but there are a few qualifications you’ll have to meet to ensure the tow is legal. If you are the owner or renter of the property, you’ll be held accountable for requesting the tow. You’ll have to provide the tow truck driver with written authorization that you asked for the vehicle to be removed from your property. This is mainly so the towing company can prove that the tow was in response to a complaint. 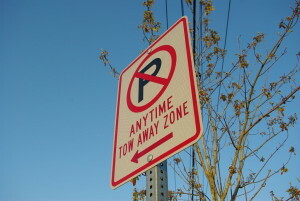 While someone blocking your driveway can be towed away with no questions asked, some less obvious areas of the property may require signage to protect you when towing away vehicles. These areas might include the curb to a driveway behind the home, a private spot, or a lot reserved for residents of an apartment complex. In any case, you must conspicuously display some type of “No Parking” or “Reserved Parking” sign. There are some instances where your residential tow may not be deemed legal. For example, drivers of inoperable cars are typically given a 24-48 hour grace period to have the car towed themselves. For more information on a specific towing situation, be sure to contact us. We’ll be happy to provide our best advice.